Orlando Food & Wine Festival: Yum! The third annual Orlando Food & Wine Fest is this weekend! The mouth-watering third annual Orlando Food & Wine Festival will take place in downtown Orlando on Robinson Street along Lake Eola on Saturday, November 13 (from 1:00pm to 9:00pm) and Sunday the 14th (from 12:00pm to 7:00pm). Was that a mouthful or what? 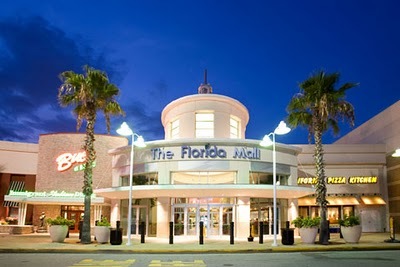 It will be presented and produced by 103.1 WLOQ, the Florida Restaurant and Lodging Association and will benefit the Children’s Home Society of Florida. To savor the event, expect to pay between $2 and $6 for the sample sized offerings from 36 of Orlando’s Top restaurants and over 50 wines from all over the world! Don’t be drinking them all though now, save some for me. Tickets are $10 for one day or $15 for both Saturday and Sunday and you can buy them here. If you’re curious as to who will be serving, here’s the list. This list includes Ruth, Mitchell, Dexter, Tommy, Charley, monkeys, an owl, a frog, and a lion, among others. It’s a jungle out there! Oh! 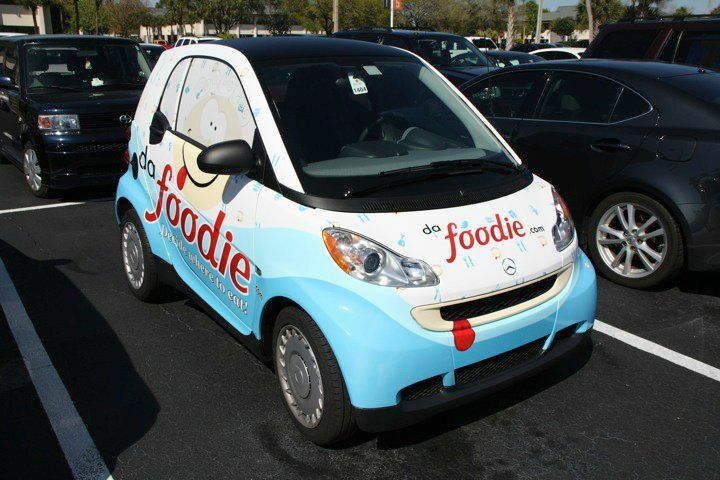 and the DaFoodie car will be there (right at the entrance) Don’t be shy… take a picture with it and upload it to the DaFoodie Facebook page for a chance to get it featured on our blog. This post was written by guest blogger extraordinaire Gustavo Hernando, AKA Dafoodie, whose incredibly delectable site can be viewed at Dafoodie.com. You can also follow him on Twitter. 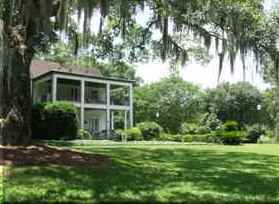 Leu Gardens and Ghost Stories…oh my! Footsteps echoed across the concrete sidewalk. Hundreds of creatures gathered for this nighttime annual event. All of this is true. But it was only a gathering of folks for the 18th Annual Ghosts in the Garden storytelling event at Leu Gardens this past Friday evening. Lead storyteller Mitchell O’Rear of Project Imagination welcomed the audience that was scattered on the lawn of the main Leu Gardens building. The sun was setting quickly over the lake. You could spy the towers of Florida Hospital in the sun’s waning light. A chill wrapped its arms around each one of us as we listened to stories scary and humorous for an hour and a half. There were seven storytellers in all. Scattered across the lawn, listeners were sitting on blankets and fold-up camp chairs dining from picnic baskets or dining on food from a vendor tent. As I sat in my camp chair almost shivering, I wondered if it was the chilly Florida air or the fine storytelling that made this evening memorable. This post was written by Guest Blogger Extraordinaire Stephen D. Nelson. Stephen is the Musical Director at Park Maitland School and has worked with the Orlando Repertory Theater since its days as the Civic Theatre of Central Florida, spending 13 years as music director. He recently spent his 25th summer teaching creative dramatics there. In 2003, Stephen was honored with the Distinguished Theatre Career Award, for his work with youth theatre. Where do I start? 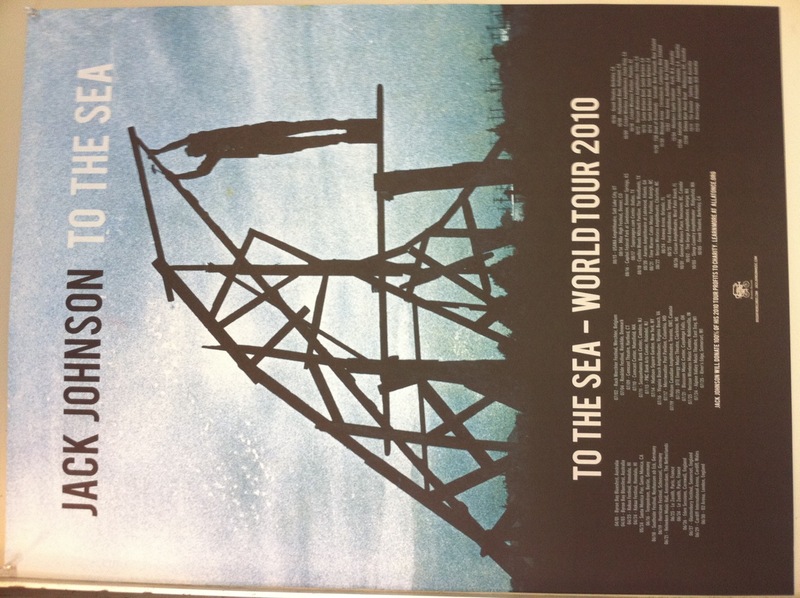 So, Jack Johnson came to the Amway Arena (not the new one, which is Amway Center) in Orlando to support his fifth studio release “To The Sea” and you didn’t have a ticket? Well, I say, when a rainy, August, Central Florida day can be instantly transformed into a Hawaiian resort, you buy a ticket for that! If I knew you well, I would even tell you that missing tonight’s show was “culturally irresponsible” and that you should rush off to either Tampa or West Palm Beach in the next couple nights and catch up with Jack. If I had the means or the time, I would do both. Upon entering the arena, we were greeted by All At Once staff members with our Village Green Passport encouraging us to take environmental action, meet local non-profit partners, and learn how Jack and his crew are minimizing the environmental impact of the tour I met the people from the Simple Living Institute from right here in Central Florida. Before we could see Jack there were some opening acts. ALO and G. Love were exceptional. ALO includes one of Jack’s musicians in Zach Gill. They played about eight songs including my favorite “Girl, I Wanna Lay You Down.” Zach nearly jumped into the crowd during a cover of “Eye of the Tiger” inserted into the middle of another their songs. While G. Love sits in a chair with a single spotlight, guitar and harmonica and lives up to his billing: “The Foot Stompin’ Street Side Blues of G. Love”. G. Love provided another 35 minutes of very entertaining and diverse music for a one man band. He has the humor, soul and guitar licks of John Mayer and adds in moments drawn from varying genres of music. I will be buying the music of both opening acts very soon and would recommend that you do the same. Well, this was my first time seeing Jack. I have long wanted to see him live. We had built it up for years that we were not seeing another concert until we saw Jack. 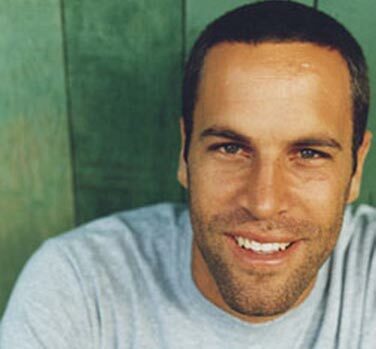 We own almost all of his music and a surf film or two. Jack did not disappoint! Two hours straight through and almost thirty songs. He played new stuff. He played old stuff He covered other artists and shared the spotlight with so many musicians. The stage fluxuated from Jack alone to nearly a dozen performers playing together. Truthfully, we were blown away at the ease with which Jack related to the crowd with many conversational give and takes from reading signs and taking requests to talking to a young kid in the front row and supplying him with protective headphones. He even dedicated songs to certain people that he would spot in the crowd like when he started “Upside Down” he said for that kid sitting on his dad’s shoulders and gestured to them. I had often wondered how such a mellow act would come off live in concert. Let me tell you that it was powerful and moving! I was emotional and blown away by how simple it was for the show to overwhelm the audience. The stage is nearly barren. There are no fancy sets, just musicians, instruments and a big screen backdrop. As Jack says near the end of the show between “Do You Remember” and “Angel” both clearly written to his wife “these are songs to you, but to me they are gifts.” After seeing Jack Johnson live tonight, his music transformed for me from songs to gifts. Thanks, Jack! I do not know what the attendance was tonight, but the arena had to be near capacity. If you were not one of them, promise yourself that you will catch Jack at the very next chance you get. Keep an eye out for G. Love and Zach Gill as I expect them to be household names very soon. And as an FYI for those of you into the green scene, “To The Sea” was recorded at Johnson’s two solar-powered studios: The Mango Tree in Hawaii and the Solar Powered Plastic Plant in Los Angeles. This review was written by Guest Blogger Extraordinaire Mike Kennedy, Central Florida resident, dad, blogger, and avid swim and beach fan. His blog can be seen at The Mike Kennedy and he can be followed on twitter at @themikekennedy. 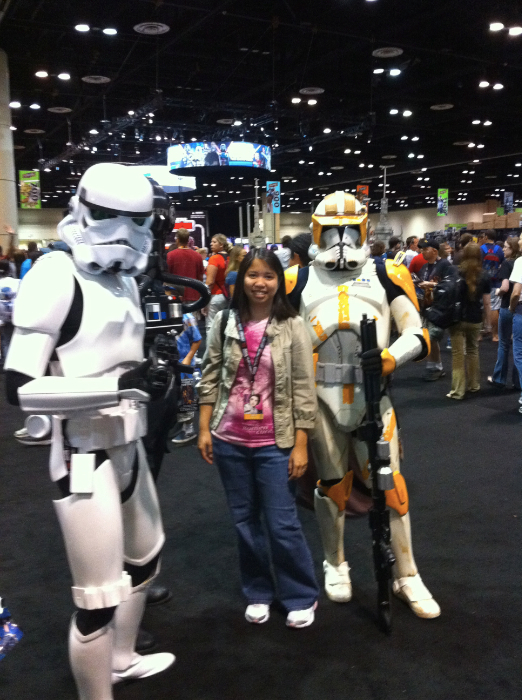 Julie Deily did such an awesome write-up on the “Top 5 Things to See at Star Wars Celebration V,” I had no idea what to share in my guest post about the event. But then it dawned on me: Growing up, I was always a little rebel so why not do a post of some of the “big, bad rebellious” things you can do at the convention? Growing up, my rebellion was very innocent by the way. It fell more along the lines of refusing to wear dresses, rejecting the color pink in favor of the color blue and ditching Barbie for Han Solo – that kind of rebellion. So when I heard Star Wars Celebration V was coming to Orlando, of course I had to go. It was an easy decision, really. Like my childhood days, I had no problem going against the grain and choosing Star Wars over, say, a weekend of shopping or a mani/pedicure. And also like my early years growing up, I found myself once again playing with the boys as none of my girlfriends showed any interest in attending. So with my own entourage of five fabulous guy friends (including fellow Orlando blogger Mr. Tasty Chomps), I set out to relive my Star Wars memories, allowing the rebel/nerd in me to shine through. 5. Get a tattoo. I’m not talking about one of those wussy temporary tattoos. I mean the real needle and ink kind. One hard-core fan sharing a table with us showed off his new piece of art over lunch on Saturday. He wasn’t alone as quite a few fans donned some pretty elaborate pieces of Star Wars ink on their bodies. To get one of your own, all you had to do was follow the buzzing noise to a secluded area partitioned by large black draping and no, for the record, I did not go under the needle. 4. Become an action figure. What better way to stoke the ego than to pose as a real life Star Wars action figure, complete with childproof packaging? 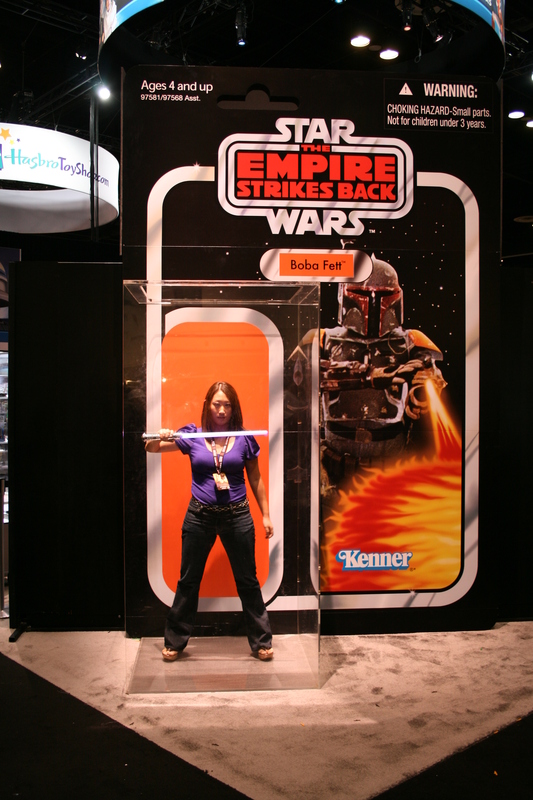 This great exhibit allowed fans to step into a gigantic plastic box which was offset by a huge background replicating action figure packaging. The key to pulling it off well? Not smiling because it makes you look “badder” – something that is harder to do than you might think! Guest Blogger Extraordinaire: Jodi Kiely is an independent consultant specializing in public relations and corporate communications. She serves a broad spectrum of clients locally, nationally and internationally. Born in Seoul, Korea, Jodi is originally from Rochester, Minnesota, moving to Orlando in 2009. Jodi has a B.A. in Print Journalism and a Masters in East Asian Studies. She is also a former Peace Corps volunteer having served in the Central Asian country of Kyrgyzstan and currently sits on the Board of Directors of the Central Florida Asian American Chamber of Commerce. You can visit her blog, JodiKiely.com, or follow her on Twitter at @Jodi_Kiely. I just got home tonight (Friday) from Star Wars Celebration V and we had a blast. My husband has been a fan since his dad took him to see The Empire Strikes Back thirty years ago. In fact, Celebration V is celebrating the 30th Anniversary of The Empire Strikes Back. Celebration V, as most of you know, is being held this weekend until Sunday evening at the Orange County Convention Center. When my husband heard Celebration V was coming to Orlando, he was really excited. We bought our tickets in advance a few weeks ago and even though I’m not as huge a fan as he is, I was getting excited as it got closer. 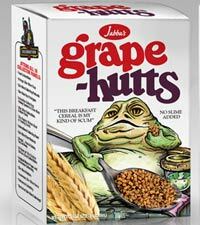 #5 Collecting Panels – Attend any of them and receive a limited edition cereal box designed especially for Celebration V. There are a total of 16 the entire weekend and a total of 16 different cereal boxes to collect. We went to the International Collecting panel, and although I’m not an avid collector (like my husband), it was pretty enjoyable because some of the panelists were pretty funny. Special edition for Celebration V.
#3 The Art of Ralph McQuarrie – The originial designer for the original Star Wars movies. There is a gallery of his original concept drawings and it’s pretty amazing how he was given direction by George Lucas and came up with some pretty awesome stuff. 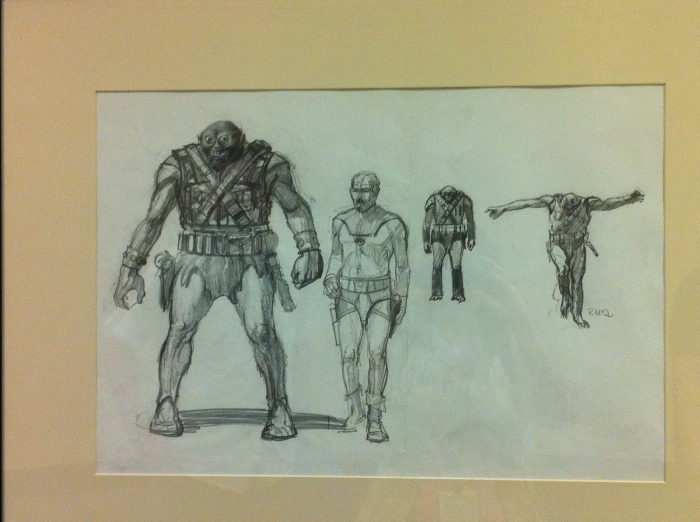 The image below is a picture of McQuarrie’s drawing for the original concept for Chewbacca and Han Solo. #2 Taking pictures with the many costumed characters, many of whom are attendees. It’s not uncommon for someone, including me, to ask to take a picture of someone’s costume or take pictures with them. It’s fun, a lot of the costumes are very well made and they are always happy to stop for pictures. #1 The exhibit hall is where you can buy all of the Star Wars exclusives as well as tons of other Star Wars merchandise and even other kinds of merchandise. Also, in the exhibit hall are some great displays that you can take pictures of or have your picture taken with, such as a huge tie fighter and a speeder bike inside an Endor background. 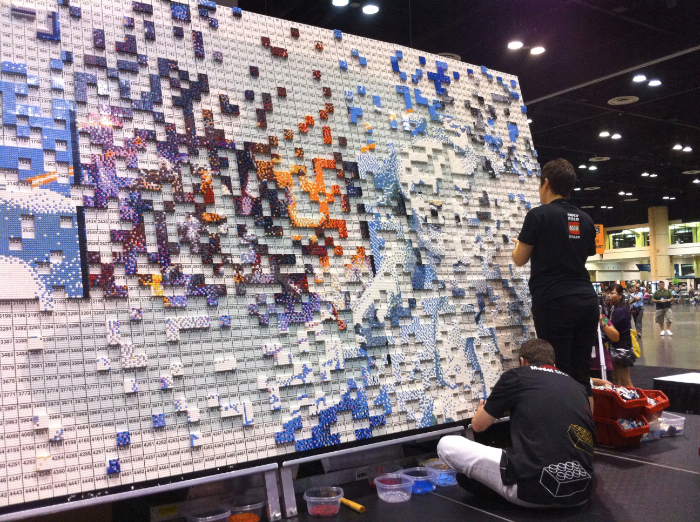 There is also this mystery Lego mural that you can help build. We participated and it was fun. 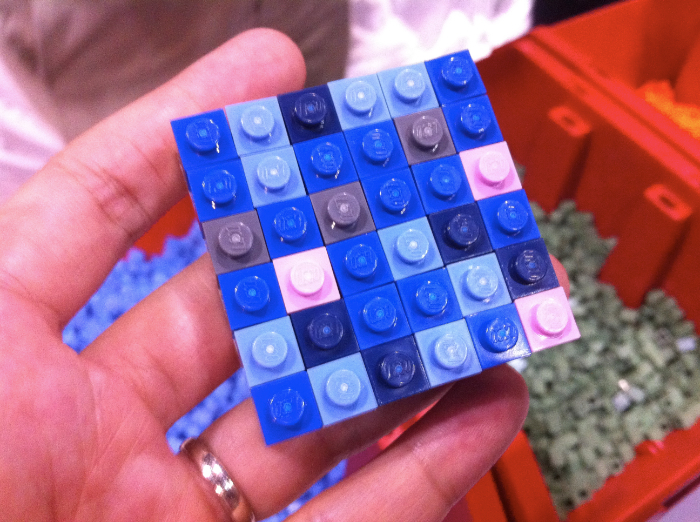 If you put your piece together correctly, you get a free Lego version of concept Boba Fett (white version). That’s a picture of my finished piece below. My contribution to the Lego mural. We had tons of fun and I wish I had one more day to spend there. 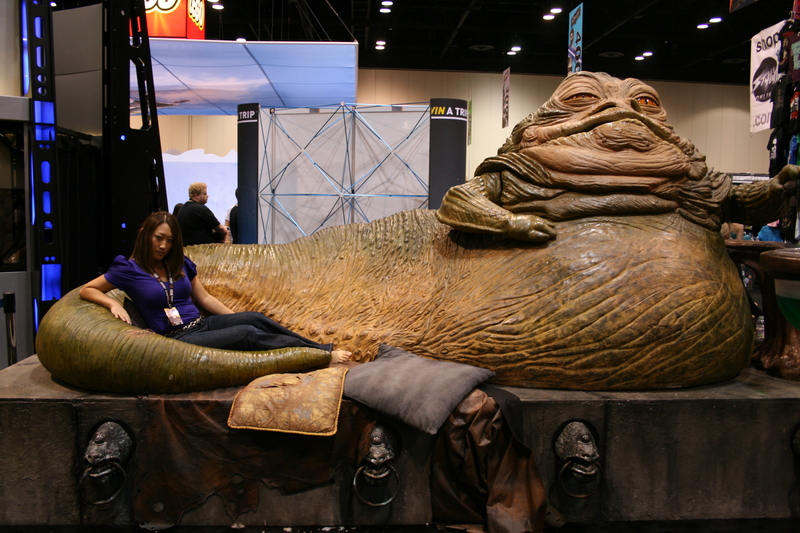 If you went to Celebration V, what were you favorite things to see? Guest Blogger Extraordinaire: Julie Deily is a software engineer and is pretty close to being a Central Florida native, she has lived in the area since she moved to Florida at seven years old. She blogs about cooking and baking at the little kitchen and also at whatever julie where she blogs about her pets as well as her participation in the Susan G. Komen Tampa 3-Day for the Cure this October as one of fifteen Energizer “Keep Going” Bloggers. 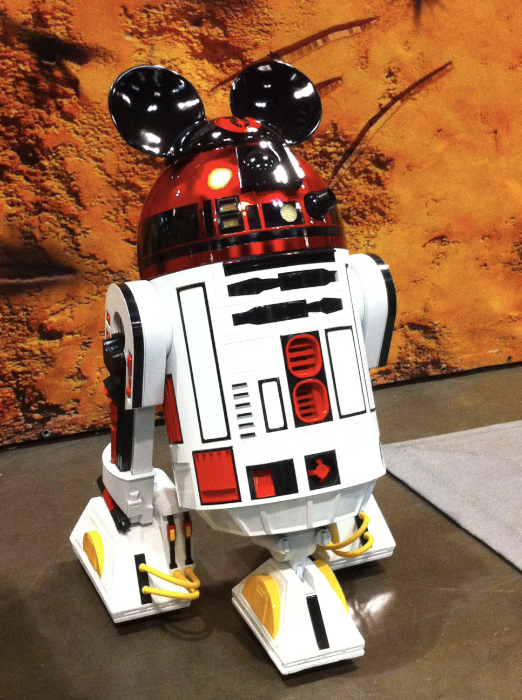 Check out whateverjulie.com for more posts and pictures from Celebration V in the next week or so. Do Some Good Tomorrow: Wildlife Jambando! Well, we’ve been working with The Plaza Theatre for just over a year now to create musical events we call Jambando where bands and fans come together in a community effort to put on the kinds of parties we want to see in Orlando, and it’s been pretty successful, so far. Last month, I got a call from Chris Charles, saxophonist and conductor of The Outer Toons and long-time friend, who suggested we put on a show to benefit the effort to clean up the Gulf. We’d all been hearing the news and the realization that the oil spill was something everyone in Florida was going to have to deal with for a long time was just starting to seep in. I thought it was a great way to do something positive rather than sit back and stew helplessly, and as the idea for the show started spreading around, it became apparent that many felt the same way including the Plaza Theatre which immediately gave us a date to work with. Jazz legend, Sam Rivers, was one of the first to sign on which blew my mind! The rest of the bands came aboard pretty quickly after that and the result is an amazing and diverse line-up showcasing some of the best music coming out of Orlando. We couldn’t be more thrilled with how this show has turned out! The Wildlife Jambando was born. To broaden the appeal of the show even further, we decided to put together some fun activities for the kids to create a Kids Jambando in the afternoon to take advantage of having The Outer Toons aboard. Their show is geared toward entertaining kids while teaching a little music education as well and are a lot of fun! Natalie Wright, violinist for The Outer Toons, did the research for us and found that The Wildlife Foundation of Florida was on the front line of the clean-up effort cleaning up the coasts and caring for the animals being affected by the spill and had already set up a Gulf Restoration Fund dedicated to the long-term effort to clean this mess. We all agreed that this was exactly the kind of effort we wanted to support and they were thrilled that we wanted to help. All proceeds for the show go directly to the Fund. Natalie also started hitting the phones and visiting local restaurants and businesses to let them know what we’re doing and we are amazed at the response. As a result, Sea World is on board as a gold sponsor and we’ve put together an AMAZING raffle to help raise even more money that features tickets to attractions, a brand, new guitar and gift cards from all sorts of places. Our goal is to raise the awareness of what’s going on and the Wildlife Foundation of Florida’s efforts, but more importantly, to give everyone a way to pitch in and help. 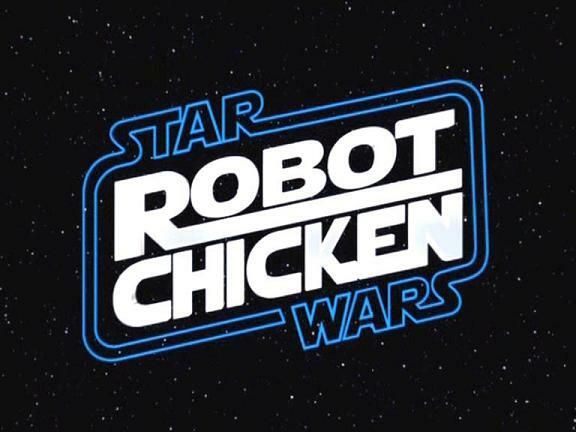 That really is the best thing about this show and everyone involved is donating their time with the sole intention of benefiting a greater good. It’s easy to get mad about all this, but I’m very pleased that we have figured out a positive way to contribute by doing what we do best… and have a great time enjoying a great show while doing it! 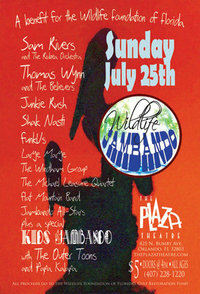 The Kids Jambando kicks off at 4PM and with three stages of continuous music, the fun will last all night long. Hope to see you there!